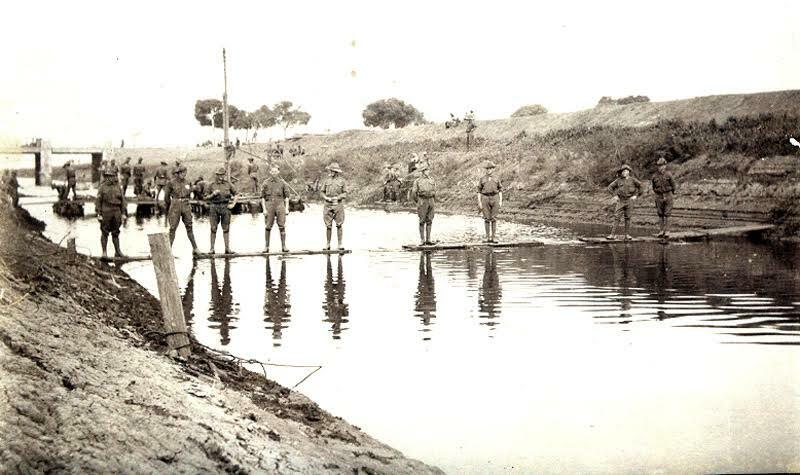 The June Diary AWM4 report from Gallipoli shows a major shift in the work required from the Engineers of the 1st FCE. 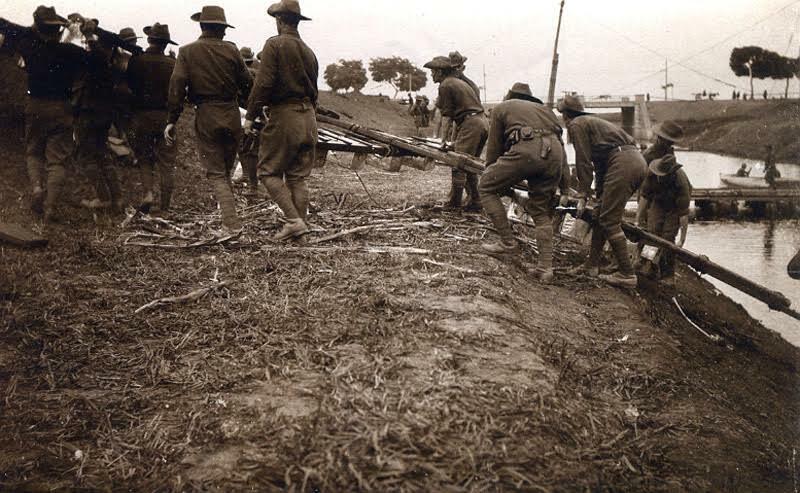 While the month of May had been random employment maintaining and building jetties, constructing trenches and grading artillery roads, the whole offensive strategy was now focused on trenching and tunneling. 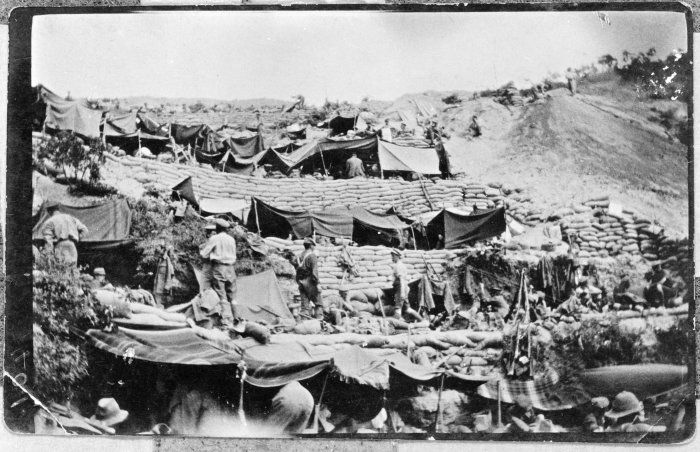 The expert hands of surveyors, draughtsman, mining engineers and the sappers, would now underpin the campaign’s ability to sustain or gain valuable ground at Gallipoli. The June war diary is full of detailed trench and tunnel data and the scope of works conducted by the engineers. The diary slowly builds through out the month and one can see the detail surrounding trenching and tunneling becoming more significant. The details may be shy of mentioning those men specifically involved, but it clearly shows the vast amount of work the engineers were engaged during the month of June. Work detailed included the re- bedding and improving of existing saps, regrading of roads and gully’s. The continual repair and replacements of parapets. The construction of observation tunnels at “Courtney’s Post”, additional loophole preparations. Tunnel cross cuts and formation of listening galleries. Very few days were involved in what was described as of a “general nature” as the enemy shelling on these days was too heavy, a reminder that they were always exposed to danger as the tunnelling and sapping was not so covert and was under constant scrutiny and engagement by the Turks. 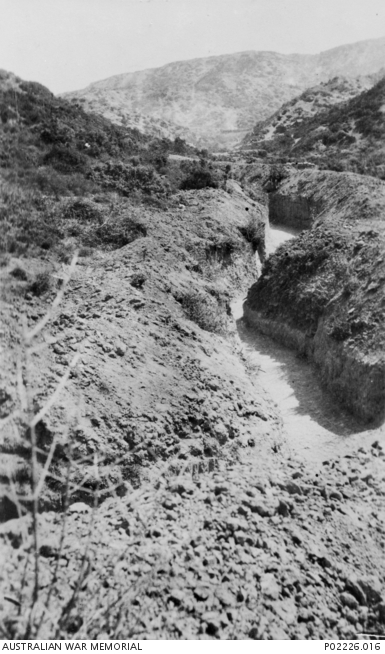 The tunnelling strategy was equally important to the Turks, and the underground game of “tunnel – chess” between the Anzac’s and the Turk’s meant building listening trenches was vital to determining the next move, which trench or tunnel to “blow-in” or when to make a change of direction. June 3rd ….. non-commissioned officers 2/Cpl 110 Gordon Wilson, 2/Cpl 30 Donald Mackay, L/Cpl 66 Norman Masters volunteered for some “blow-in” work but an infantry raid had prevented the operation from proceeding. This was the just the start of a great display of heroics from Lieut Richard Dyer. The list of men above was prepared by sapper 90 George Chisholm under the instructions of Lieut. Bachtold . These men were stationed at “Courtney’s Post” between June and August, this was their home for the next three months. Sketch 38 also above, is a trench and tunnel diagram as drawn by Lieut. Bachtold , showing the position of Courtney’s Post and positions of new work tunnel D10B and tunnel D14 . Lieut Bachtold had an initimate knowledge of D10 as he was not afraid to crawl around and lay barbed wire entanglements while under fire. It is very possible some of the men on this list are in the header photo of Courtneys Post as it was taken in June 1915. Impossible as it is to identify them, it is somewhat comforting to see them going about their daily routine as ” Courtneys Post” had become home to many of the original sappers. 213 Roy Denning was wounded on the 16th June by shrapnel and thought it was simply a flesh wound until he realised it had pierced straight through his leather belt and only just missed his spine “by a whisker”. Roy was lucky to be wearing his belt. The doctors arrived quickly, warning Roy it was going to hurt, then removed the shrapnel with a knife, and he was then stretchered off to the hospital ship. 19th June…….250 Fred Wicks was not happy about his wounding either, he was happy to dismiss it as a minor flesh wound. He was wounded by shrapnel whilst delivering crates of biscuits. His wound was considered far more serious than he later described in his letters to his family, but that was Fred’s nature………………….. 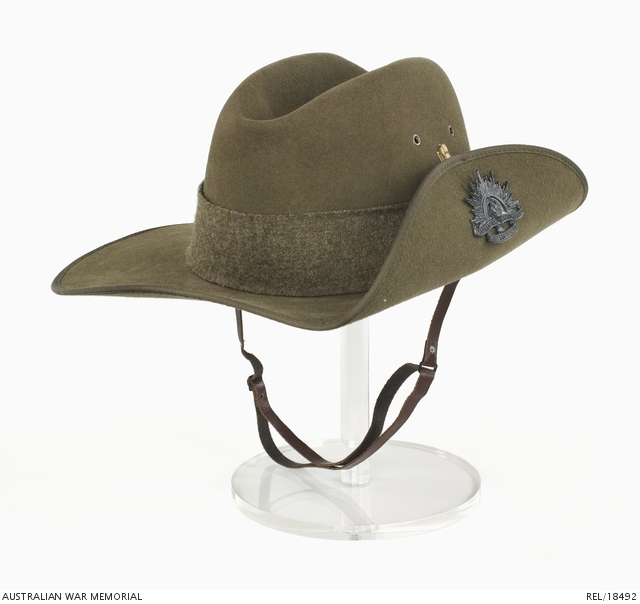 Both Fred Wicks and Roy Denning would return to Gallipoli, and would see the distance throughout the war and both would later distinguish themselves in the field. 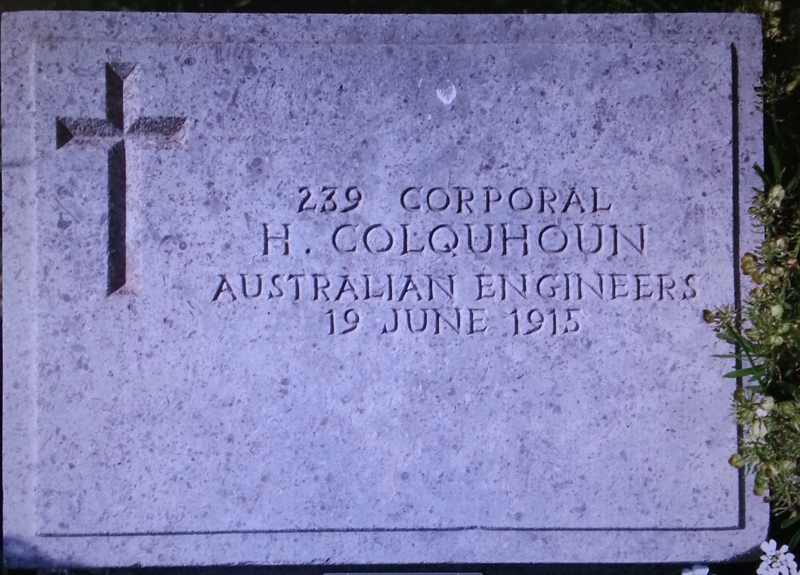 On the 19th June sadly the sappers lost another original, Cpl 239 Hugh Colquhoun… died from wounds, the circumstances of which are still unknown. His name was later included with other engineers on the famous memorial cross……………..
June 23rd……. “Lieut. Bachtold went out in front of D10 last night at great personal risk, laid a series of barbed entanglements in front of position. Rifle fire continuous during the whole time he was out from snipers concealed in valley”.………………Both Lieut Richard Dyer and Lieut. Henry Bachtold were officers who never hesitated to lead by example. Their early days at Gallipoli as young officers always willing to lead at the front was outstanding and just a taste of what was so characteristic of these great men. June 25th…….Major Corlette was admitted to hospital with general debility. 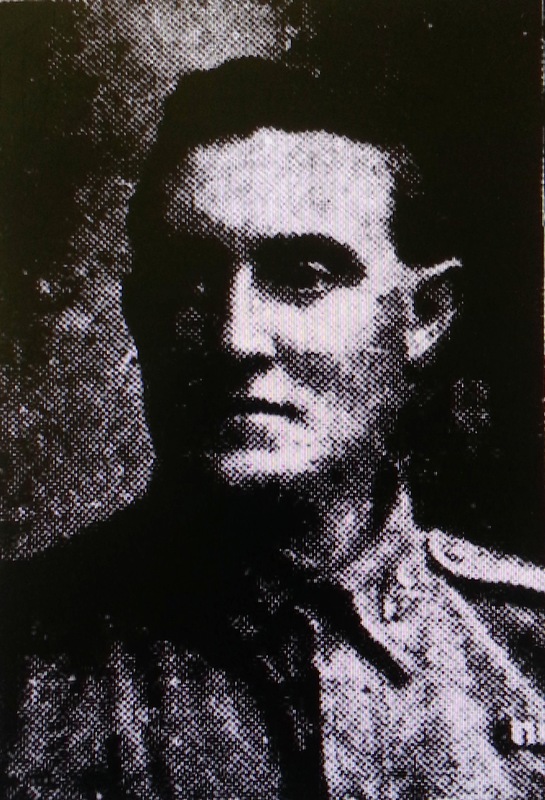 June 28th……..35 Sapper Walter Robertson was wounded with rifle fire to head and nose. This “rough carpenter” was a very tough individual, he would return to Gallipoli and was later awarded a Military Medal………………………. On the 30th June Lieut Biden had gone to hospital with diarrhoea. For the officers and ranks of the various Field Companies, June was a heavy month of planning, preparing new trench’s and tunnels. The tunneling strategy was now a major commitment from the ANZAC Forces, and what became known as the “The German Officers Trench” had become a strategic target in the eyes of the command and would become the main focus for the ensuing months, ultimately leading to a number of assaults that would distinguish a few more of the originals in the field…………………………. Hugh was 30 years old, a native of Greenoch, Scotland. He was an Engine Fitter with considerable experience and also had been in the royal engineers as a Corporal for 12 years. According to Hugh’s sister, when he arrived in Australia he was working for the Ashanti Goldfields Corporation in Western Australia. Both his parents were deceased and his brother and sister lived in Scotland. Prior to enlisting he had been living with his auntie, Mrs Gamble, in Pyrmont Sydney and unknown to his aunty he had a girlfriend…… Mary Singleton of Randwick, which he was intending to wed. 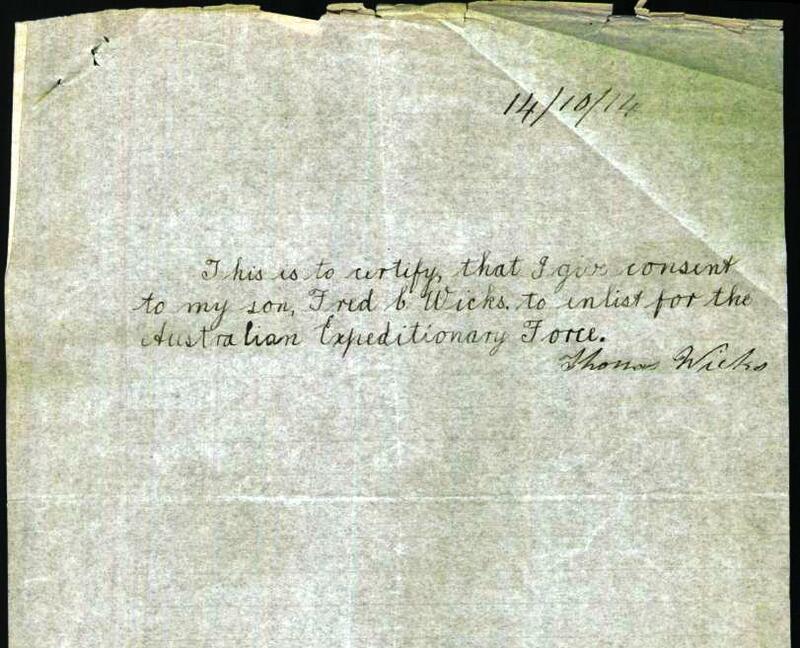 Unfortunately Hugh died from wounds on the 19th June 1915, Gallipoli… circumstances unknown. 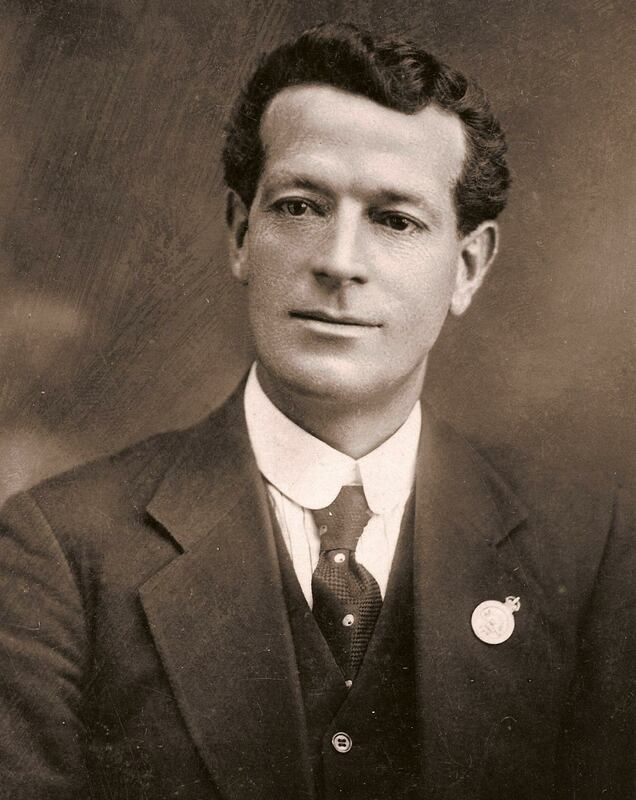 After his death at Gallipoli, his estate was argued by his auntie, Mrs Gamble and his fiance’ Mary Singleton. The records initially showed his NOK was in fact his girlfriend Mary Singleton and by her account they were intending to marry and she knew of his aunty and Hugh’s living arrangements with his aunty. She received his personal effects after the war and most correspondence was related to her via solicitors. However the Auntie was quite concerned that this was not the case as she believed her nephew had …“never met this woman”… and that… “he must have been under the influence of drink” when this information was taken down. It would appear that auntie Gamble did not approve of Miss Mary Singleton…… and sadly his memory was somewhat hijacked by these circumstances. 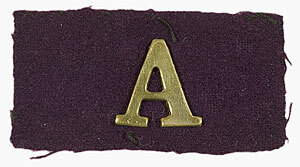 A later copy of his attestation shows an update to his file as his brother Charles in 1920 was officially now his NOK. His brother later received photos of his burial site. 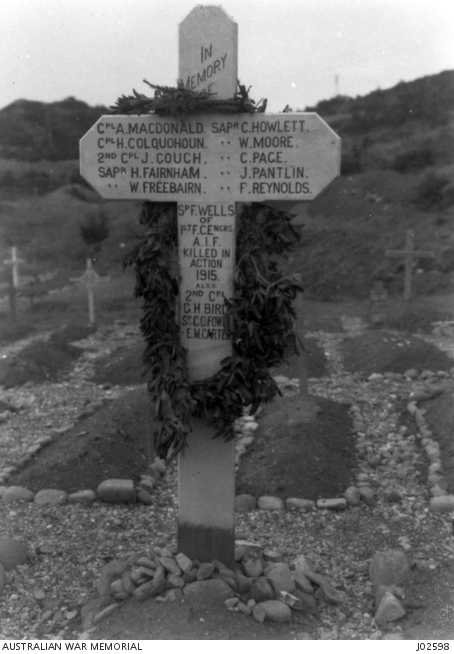 Hugh’s memory is preserved forever at the Beach Cemetery- Gallipoli and the AWM Honour Roll and his name was hand cut in the cross erected by his mates in the 1st FCE. 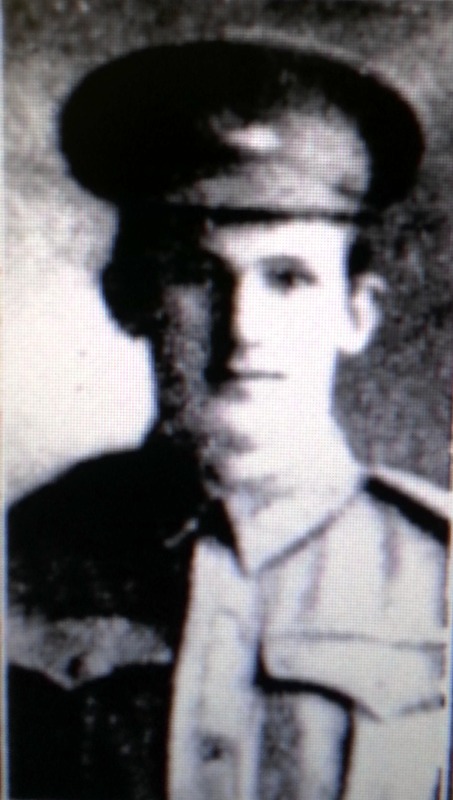 214 Lewis Dyson enlisted at Leeton, NSW. He was nearly 31 years old, born in Huddersfield Yorkshire England. He was a well-travelled man, previously having spent 5 years in China involved in civil works programs, and unconfirmed , but highly likely was a civil engineer involved with the new Murrumbidgee Irrigation Area Project in Leeton NSW. Living and working in Leeton at this time had a promising future, the irrigation works planned by the NSW government were some of the largest in scale ever undertaken and the surrounding areas were no doubt set to prosper with employment and farming opportunities. Lewis Dyson had been in Leeton long enough to make it his new home, establishing close friendships and many associations as his story reveals. When Lewis was at Gallipoli, he wrote to friends in Leeton, who had his letters published in the “Murrumbidgee Irrigator”. His letters on the landing at Gaba Tepe and life at Anzac would have been gripping, and he would later pay tribute in a letter about his good friend “Bozzie” who was killed in action. After the war Lewis returned to Leeton, perhaps trying to take up his career where it left off before the war. Evidence suggests that it may have been difficult and short lived as he moved about visiting China, New Zealand and America. By the early 1930’s Australia was in the grip of the world economic depression, Lewis was now 50 years old , he was divorced and his wife had remarried and he had been unemployed for 18 months with only the occasional work . On the morning of the 24th March 1933 , Lewis jumped, “wilfully casting himself “ from the pylon of the Sydney Harbour Bridge. He was a man who had seen the world for better or for worse, a man who even in the trenches at Gallipoli had dreams of returning home from war and enjoying the “times to come after the war”. Things were definitely difficult for Lewis and we will never know how unwell he must have been to take his own life, but on that fateful day ….. he decided he had tried and done enough. 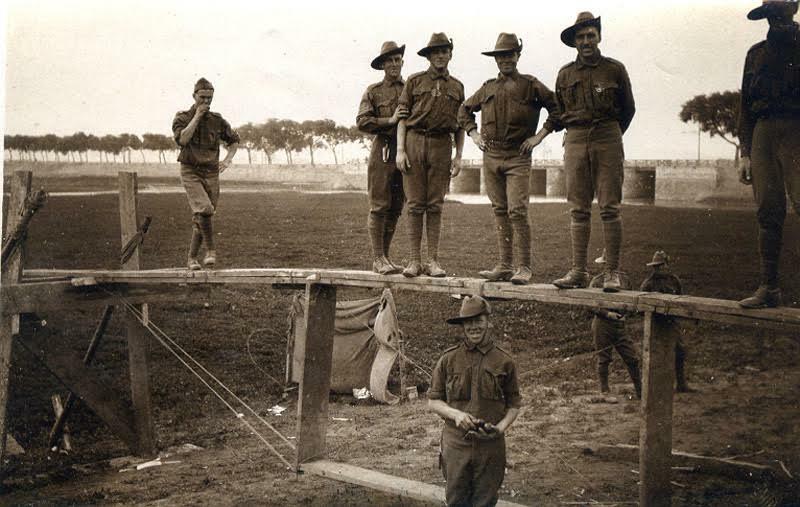 The Australian War Memorial has Archival footage of the Engineers camp at Moore Park, Sydney. Possibly filmed anywhere from late 1915 to early 1916 as still photographs from this footage were published in the “Sydney Mail’, on March 1st, 1916. It gives a panoramic view of the Engineers camp and footage of the Engineers marching out of camp with horse-drawn wagons containing pontoon bridge equipment on their way to Centennial Park. 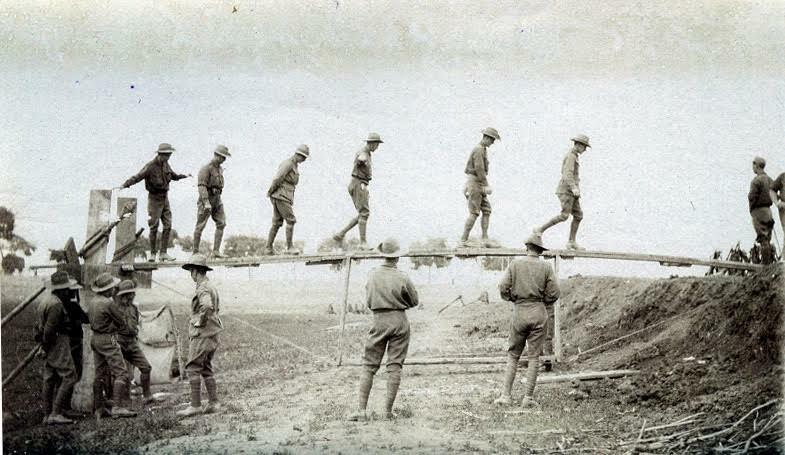 It shows the Engineers constructing the pontoon bridges and rowing them into positions and then tested. A wooden footbridge is also constructed and showing its complexity. At the end, Signal training using flags, heliograph, telegraph and radio is demonstrated. 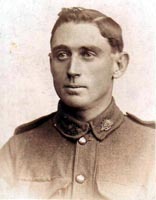 Sapper J. W. Hutchison was not an original member of the 1st FCE, but was later a sapper with the 14th FCE. He was clearly inspired by the men of the 1st FCE and dedicated these verses to them and the quiet achievements of the Engineer. It is a wonderful piece from the time, helping define the work of the Engineers . For the big guns in the rear? — ‘Tis The Sturdy Engineer. On a road that’s none too neat. 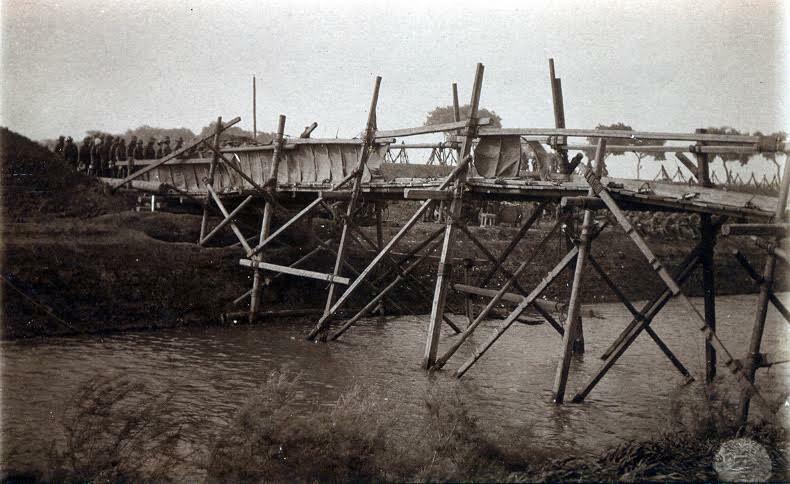 The Engineers spent much of their training dedicated to bridge construction. This is considered a vital and perhaps the most important combined skill of the Sappers/Engineers. 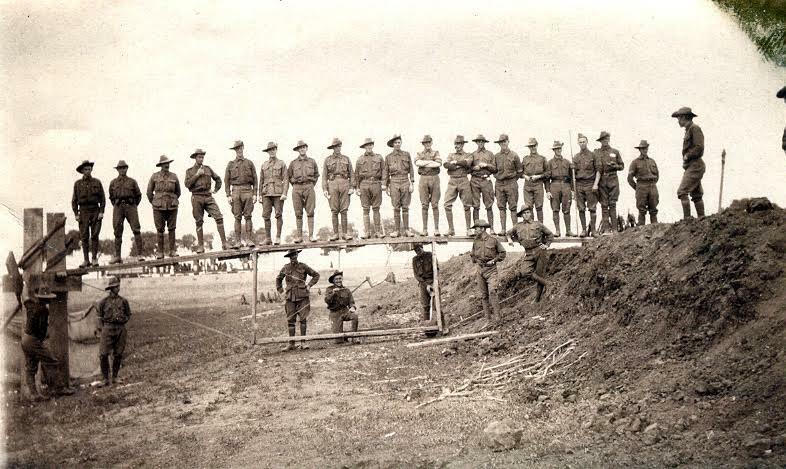 The trained engineer, the surveyor, the bush carpenter, the fitter, blacksmith, the harness maker, and all the tradies alike were all equal to the task of bridge building, the men of the Field Company Engineers would be very proud of their work and the support they provided to the troops, maintaining vital transport links and constructing roads and bridges for troop, artillery and supply movements. The following photos below show original members of the 1st FCE enthusiastically building bridges and displaying how proud they were of their work. These photos have been kindly donated by the family of Bob Lundy from his Private Collection. 1. Looking to identify the men in these photos. Please contact us if you have any knowledge of the men in these pictures. Frederick came from a large family of 6 sisters and 4 brothers – His mother Annie Eva Wicks ( nee Miller) had died only 6 months before he enlisted, she was 56. A fine looking man, and very proud to be wearing his AIF medal. This immaculate looking gentleman is John Leslie Waters... an “original” low number 47. Unlike the story of many young single men going off on the “Great Adventure”, John’s story is unique.